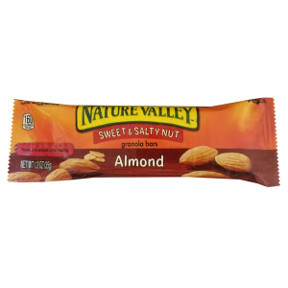 1.2 oz travel size nut and granola bar in sealed package. Naturally flavored. Dipped in almond butter coating. Bursting with almonds. Ingredients: almonds, high maltose corn syrup, rolled oats, sugar, high fructose corn syrup, crisp rice (rice flour, sugar, malt, salt), palm kernel oil, wheat flakes (whole wheat, sugar, salt, malt), fructose, canola oil, water, yogurt powder (cultured whey protein concentrate, cultured skim milk, yogurt cultures), maltodextrin, salt, nonfat milk, soy lecithin, color added, honey, natural flavor, baking soda, honey, sunflower meal, peanut flour. Mixed tocopherols added to retain freshness. Contains: almond, wheat, milk, soy, sunflower and peanut ingredients.